So I've decided to finally finish what was due a long time ago. I have two awards and a lot of stories to share but unfortunately, no pictures to show. Anyway, let's cut to the chase and get back to business. The first award would be the One Lovely Blog Award. First of all, we would like to thank Ian from Sheba's Life Story for these two wonderful awards. Forgive me for taking a long time to post it here. 1. I love coffee. I have a habit of drinking cold coffee twice a day. My day feels incomplete without it. 2. My hobbies include watching Anime, Sci-Fi movies and TV series'. I am a big fan of Zombie movies, games and The Walking Dead. This all started when I first watched Resident Evil 1. 3. Chooey and Buchi are walking buddies on leash. Whitey simply follows us off-leash. 4. I miss Peanuts but I know she's in good hands. I asked for an update about her and the description given to me was, "Her fur is green because she likes rolling over the grass and running all over the lawn.". I have yet to see how she looks like. Awww, Peanuts! You're too smart for your own good. 5. I eat four meals a day. ^_^. Breakfast, lunch, snack time, dinner! The house I'm currently living in usually serves fish and vegetables, which is why I'm eating healthily right now. 6. The dog tricks Chooey knows are Sit, Up, Down, Bark, and Bang. Buchi knows Sit and Down while Whitey knows Sit and Beg... Rin knows how to whine like she's talking. 7. According to my mom, Ginger, Coal and BD have grown fat. She wasn't aware she was feeding them too much. She thought the 2-3 cups of dog food was to be given every meal when it was meant for an entire day's consumption. I would like to nominate the following awesome blogs. These bloggers are just some of my newest friends and I'd love to introduce them to everyone. 1. Susie and Sidebite. I have to admit, I hardly know what's in Susie's mind. I just love reading about them and seeing their Oh-So-Cute Scottie pictures. 2. Urbanhounds. This is one of the blogs where we can actually see who Mom and Dad are. All the little puglets, Bob, and Norby, of course, have such beautiful city adventures to share. 3. The Dougall Diaries. One of the newer family members of our blog community, Dougall and Floydie are such an adorable pair. 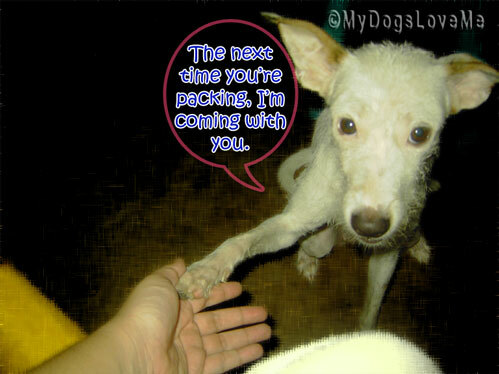 The pictures in their blog are enough to give you a dose of doggy cuteness. 4. Scrappy of Yorkie Tails. IS A GIRL. Yes, dear friends, just like our adorable beloved Pip, Scrappy is also a Yorkie who is often mistaken for a little boy. 5. Fuzzy Tales. Even though I'm a dog lover, I do visit cat blogs, too. Nicki and Derry often post the best cat boxing/tussle/wrestling shots. That's enough to make my day. 6. Colby of Puppy in Training. A lot of you are familiar with our puppy expert. If you need some puppy advice or are just in the mood of seeing many puppies wearing the cone of shame, his website is the place to go to! 7. Lisa of Dogs N Pawz. Dogs n Pawz is quite an informative site. It's a bloggy and webby combined. That said, I have to thank her for giving me the opportunity to read the Follow the Dog Home book I've reviewed recently. Congratulations on both your awards. Have a lovely Saturday. Concatulations on two very well deserved and awesome awards! Congratulations on both your awards! Mommy needs an iced coffee every single morning! Hi I'm glad you're happy with your awards. Congrats on your awards! Nice to get to know you more! Congrats on your awards. We know all about procrastination. Hope that blood blister is all healed...or at least nearly. Congratulations on your award and thanks for sharing it with us! Congratualtions on all those cool awards! I like your seven things ... being a nosy sort of person :). ConCats on your awards :)) Must go look out the new blogs! Congratulations on your awards! They are so nice and well deserved! Sorry you are missing your sweet Peanuts. At least it sounds like he is having a fun time with your mom. The story of him turning green is so funny! And it is an adorable picture. Have you seen the Norwegian film, "Dead Snow"? It is a fun zombie flick. Sure thought we left you a comment Saturday, guess not, so. Thanks so much we will get it out ASAP, Dads gone for a bicycling adventure through the 8th, again thanks for tinking of us guys!!! !